I was a BPO employee, learnt from my personal experiences about switching my job to Digital Marketing career. The worst part about BPO is their long hours and non stop calls on headphone. Everyone loves to talk on phone if its valuable and enjoying, but really for 10 hours back to back 200+ calls??? Think again! Everyone is somehow don’t love Mondays and that is the biggest reason of understanding as how much we hate our 9 to 6 daily work cycle. When i started back after leaving BPO job profile, i took first step by choosing what business type i may find suitable to my career, of-course i had no idea of market, people, demographics, conversions, tracking, end user etc. They all were jargon, nothing was suitable as i was a plain paper and i had to write my own story. No business background or family touches and support, but i was sure i wouldn’t be back to job again and that’s what motivates me for my Digital Marketing Career. I took a leap and chose a name for business, booked domain (had no knowledge what domain is), my friend helped me book a hosting account and taught me to learn basics too. Started googling how to run a business, what are the best ways to call people (traffic word was a jargon at that time for me) on website. How to sell graphic design services, how to sell websites to a client, how to prepare proposal, contracts. How to register business, what all is required and a hell lot of things. My question is was that easy??? Was that easy for most of you first time entrepreneurs/ bloggers??? Was not at all for me too. Instead of failing and getting demotivated, i took time, took pressure, took attitude not to give up no matter what. No contacts with web knowledge. So, for all first timers, i can feel your pain, i had my own too. I decided to help people, because i don’t want you to be lost in jargon and waste your valuable time getting best resources for Digital Marketing Career. in order to become a Digital marketing expert, you should follow below steps. Choose what you love or what you know already. (Food, books, pets, airplanes, scrapping, collectible whatever, and think how it can help others. Think and write sources, how you cam make money out of it and write as many ways possible that comes to your mind. No sure of how to proceed with point 1 and 2? Go to facebook and type your business top words and group after that and search, join some groups related to your planned business idea and ask questions, just don’t give up when you don’t get answers right away. Everyone is online. Trust me everyone (there is no backward areas if you are even living in UP, Bihar, Jharkhand, Africa, Jungles or anywhere in India or world. So better be online. Create a basic website (self learning is best way before hiring, at least nobody can make you fool). Join social media channels mainly, Facebook, LinkedIn, twitter and watch how people react and engage with similar niche businesses as you do ( don’t start selling your products and services, i know you are burning capital and have limited resources). Here are some best tips to engage on social media in best possible way. Invest 30-50% of profits back in business to generate more leads by doing Facebook/ google ads at first hand and enhancing your productivity like if you do web designing, buy some premium templates to use for client website designs that helps in attracting more business. Do blogging because it is the most important part as SEO is all about quality content and content can be targeted to people using keywords, so more content, more keywords, more searches on google for your business, more traffic thus more sales. So start right away after you setup your website. Submit your business to “Google My Business” so that local nearby people can find you easily. Blog is free with WordPress installation, just you need to get used to of dashboard, writing, SEO basics and publishing on WordPress. Online promotions using internet as a medium comes under Digital Marketing. Digital Marketing career in India is in top demand these days and demand is more than supply as per industry. Businesses are forced to use Digital Marketing as a medium of sales and marketing due to the increase in the consumption of content on Digital mediums and better targeting methods than traditional media marketing methods. 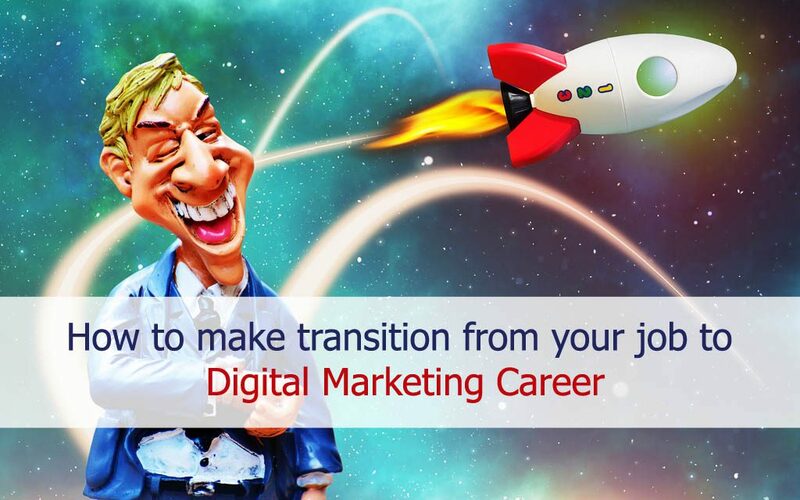 There is a great scope of your Digital marketing career with variety of job types to start with. You can check multiple job openings at shine job portal and can submit your resume for future job postings related to Digital Marketing career for SEO, SMO, PPC, Digital Marketing executive/ manager etc. All these steps helped me in long run for my Digital Marketing Career. I know i can write more on it and first timers need more help to get started. Comment your ways how you drive your strategy. Good luck and stay positive always!